We are so used to the luxury of cooking in a kitchen with the help of numerous appliances that many of us will be unprepared in the event that we no longer have access to technology. For instance, we tend to forget that such basic devices like microwaves and ovens are relatively recent inventions, having been first developed less than a hundred years ago. It wasn’t that long ago that people had to resort to more complicated ways to cook their food, or even go without cooking it. Fortunately, there are simple ways to provide you and your family cooked food in times of emergency. 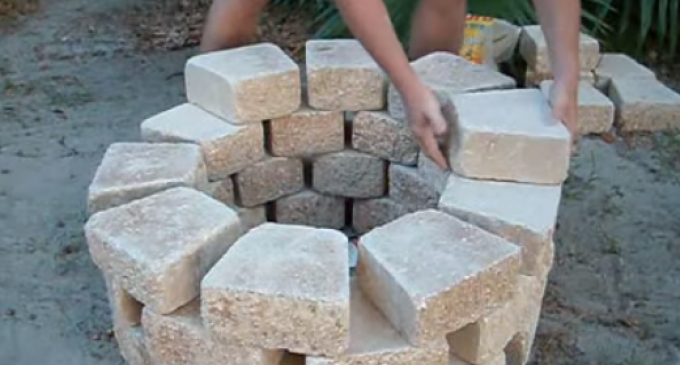 For less than a $100, willing individuals can assemble the necessary materials to make a good old-fashioned fire pit. Using 3/8” rebar, 4 sst hose clamps, a charcoal grate, and 36 stone blocks, you can build a trusty pit for roasting wienies, grilling chicken, and even making smores. I help out a buddy of mine when he needs a hand, he gave me a bunch of stones and built the same pit at the lake last year, you won’t go wrong with this one. Thanks for teaching me another way to cut off air flow to a fire, extremely helpful.